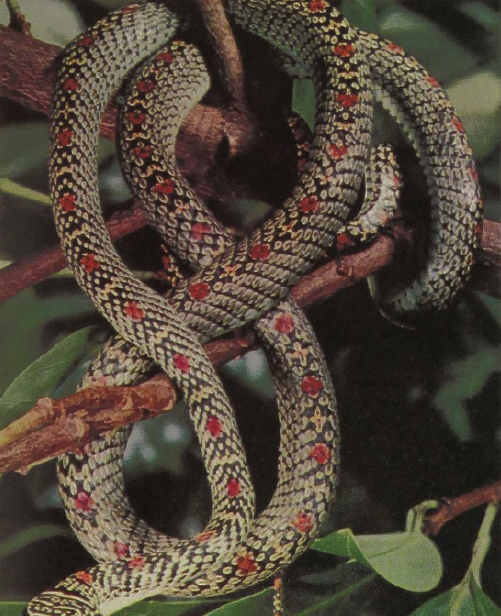 Some half-dozen snakes of this beautiful arboreal genus are found in various parts of the Indo-Malaysian tropics. All are excellent climbers and show various color patterns with the scales of the back, often jet-black, setting off spots or margins of light or saturated green and yellow. While there is some question about the classification of the group, it is clear that at least two of the species are excellent gliders. They launch themselves into the air, keeping their body in an S-shaped curve and steering with the tail. Apparently the belly scales are flattened or hollowed and produce a parachuting effect, slowing down the fall and causing the snake to glide sideways in a well-controlled fall. About 3 feet long, these snakes feed on small lizards.